Prabhu Deva Sundaram, a Dancer, Choreographer, Actor, Director and Producer has innumerable hard-core fans in the film industry. He has showcased his talent in various genre of movies including Bollywood, Malayalam, Telugu and Kannada movies. Fans refer him as Michael Jackson of India. 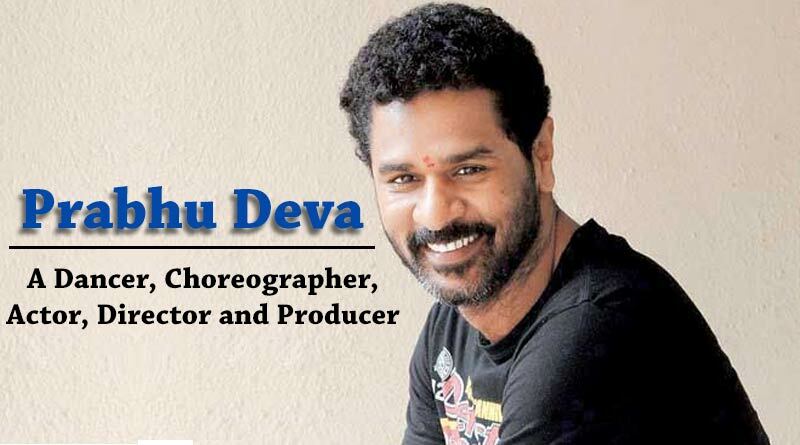 Prabhu Deva was born on April 3, 1973, in Mysore, India. He grew up in Alwarpet, Chennai, Tamil Nadu. His father, Mugur Sundar, a choreographer in South Indian films, was an inspiration to him. He started taking up dance forms classes such as Bharatanatyam and Western styles from an early age. Prabhu Deva gave his first appearance as a boy playing flute in the song “PanivizhumIravu” in a Tamil film “MounaRagam” in 1986. In 1989, Deva came as a choreographer for the first time in the Kamal Hasan starrer “VetriVizha” and today he has choreographed for over 100 movies. Prabhu Deva along with R. Rahman and Shobhana delivered a performance with a dancing troupe of Tamil cinema at the “MJ & Friends” Michael Jackson tribute concert in Munich, Germany held in 1999. Prabhu Deva is blessed with acting talents as well. In 1994, he made his debut from the film Indhu. Prabhu Deva has worked in Tamil, Telugu, Kannada, Malayalam and Hindi films. In 1997, Deva received accolades for his outstanding performance in“MinsaraKanavu”, Rajiv Menon’s romantic drama. The film featured Deva alongside Kajol and Arvind Swamy and garnered four National Film Awards, a Filmfare Award and three Tamil Nadu State Film Awards. Prabhu Deva also received National Film Award for Best Choreography for the song “Vennilave”. In 2004, Prabhu Deva was honoured with National Film Award for Best Choreography, Star Screen Award for Best Choreography and Filmfare Best Choreographer Award for the movie Lakshaya. Deva has also directed various films and received Vijaya Award for Favourite Director for the movie Pokkiri in the year 2007. Prabhu Deva served as a director and chairman of the Prabhudeva’s Dance Academy in Singapore in 2010. He has also started a dance school named Navarasa at Bangalore.